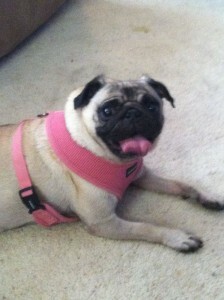 Frankie is a 3 year old fawn pug from an owner surrender. We are seeing how she reacts to better food and a more caring environment. I think a lot of the skin and ear issues will go away with good food. Looking forward to an update from the foster home. Foster home update – Frankie is a rambunctious lady who loves to be close by and likes to give kisses when your on the ground doing push ups. She loves to watch tv and of she sees an animal or something else that catches her fancy she will get up and bark at the tv. That’s how we know she’s actually watching. She loves to be outside, doesn’t mind our other dogs and does FANTASTIC in the kennel while we’re gone. She’s knows how to sit and we’re working on teaching her to stay next to you on the couch unless she is called onto a lap. I think she will make a fantastic pet, especially for a family with kids who will run around with her. Happily Ever After story: You would think she has been with us forever already. After the first day she felt like she was totally comfortable with us and Fraizer. She just transitioned right in and fits perfectly! The first night here she slept in her doggy bed on the floor in our room and snored the night away! We took her and Fraizer for a walk around the lake that first night and she was so cute trying to bark at the geese and ducks. Fraizer had to keep up with her and she gave him a good run for his money! She is an amazing little pug and we just love her! She gets me up every morning between 6:30 and 6:45 and is a ball of energy from the start! She just makes us laugh with her spunkiness. She has been amazing with the girls and they just love her to pieces! I’ve posted a couple of pictures of Frankie and Fraizer together on the PPN facebook page if you have seen them. They are getting along so well, Fraizer was so lonely after Coopers passing so this was just what he needed! We are so thankful for Frankie and all the work that everyone at PPN does for Pugs! They are the most amazing dogs and hold a very special place in our hearts!! !